The best known Irish census substitute is Griffith's Valuations which was a listing of who the renters were and who owned the property. It began about 1848. 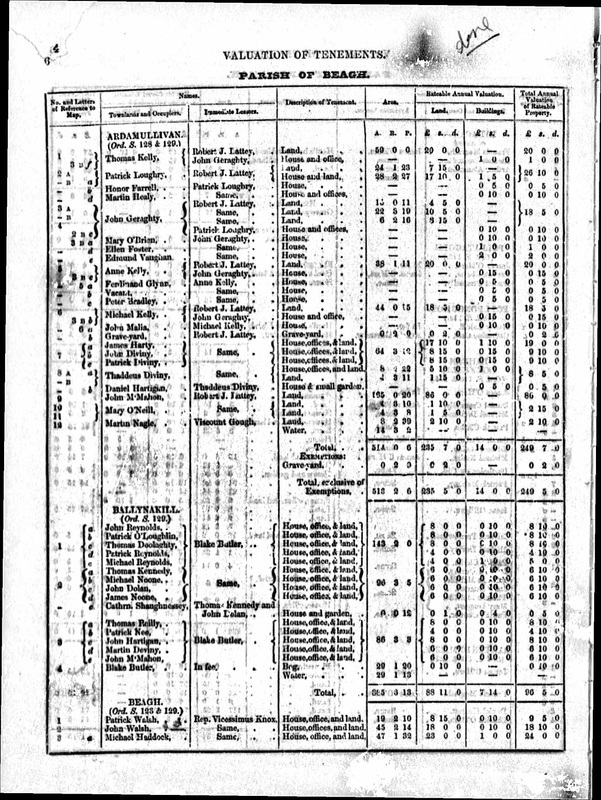 Griffith's Valuation has become a vitally important "census substitute" for mid-19th century Ireland, in the years between the Great Famine and the beginning of civil registration in 1864. Each entry gives this detailed location information for each plot, along with the occupier's name, the immediate lessor (landlords - who is not necessarily the owner) name, description of the property, acreage, rateable valuation of the land and buildings, and annual valuation. In 1852, the valuation format was changed in the midst of the valuers' work. Thereafter valuation was done by Poor Law Union (rather than Barony). The poor law union was introduced in 1838. Between 1838 and 1852, workhouses were built throughout the country, each at the centre of an area known as a Poor Law Union (PLU). These workhouses were generally situated in a large market town and the Poor Law Union comprised this town and its catchment area, the result being that the Unions in many cases ignored the existing boundaries of parish and county. Prior to 1971, the British monetary system consisted of pounds (£), Shillings (s) and Pence (d). In Griffith's Valuation values are represented as "£ s d" (or "LSD"), so for example £12-11-10 would mean 12 pounds + 11 shillings + 10 pence. Twelve pence (12d) equalled one shilling (1/- or 1s), and 20 shillings (20/- or 20s) equalled one pound (240pence). ie £2-9-3d plus £2-11-9d = £5-1-0d. Converting Griffith's Valuation values to present day values, e.g. £1 sterling in 1850 would be worth around £65 sterling (US$109/€92) today (2014).